Fig. 4. Pja2 interacts and down-regulates TCF/LEF1 by enhancing ubiquitination. (A) Pja2 interacts with TCF/LEF1. 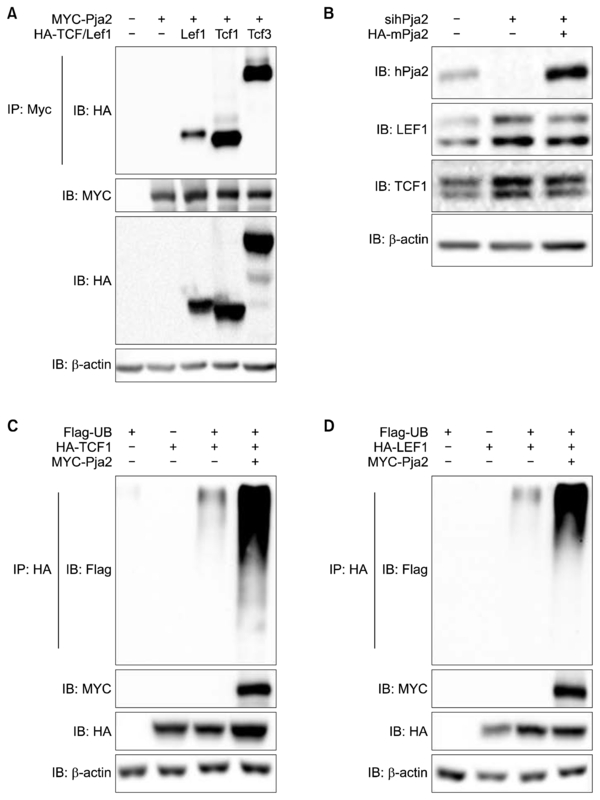 MYC-pja2- and HA-tagged LEF1, TCF1, and TCF3 were co-transfected into HEK293T cells. Lysates were immunoprecipitated with anti-MYC and immunoblotted by HA. (B) Pja2 reduces levels of TCF1 and LEF1. HEK293T cells were transiently transfected with siRNAs for pja2 and HA-pja2, which is resistant to siRNA, as indicated in the figure. Expression levels of proteins were measured by immunoblotting with the antibodies indicated in the figure. (C, D) Pja2 ubiquitinates TCF/LEF1. Flag-UB, HA-TCF1/LEF1, and MYC-pja2 were transfected into HEK293T cells. Lysates were immunoprecipitated with anti-HA antibody and blotted with anti-Flag antibody to measure ubiquitination of TCF (C) and LEF1 (D). Western blotting was performed with the antibodies indicated in the figure.